Spinal stenosis is a condition in which the spinal canal begins to narrow which in result causes the spinal cord to become compressed. Severe and chronic neck or back pain is a symptom of this condition. 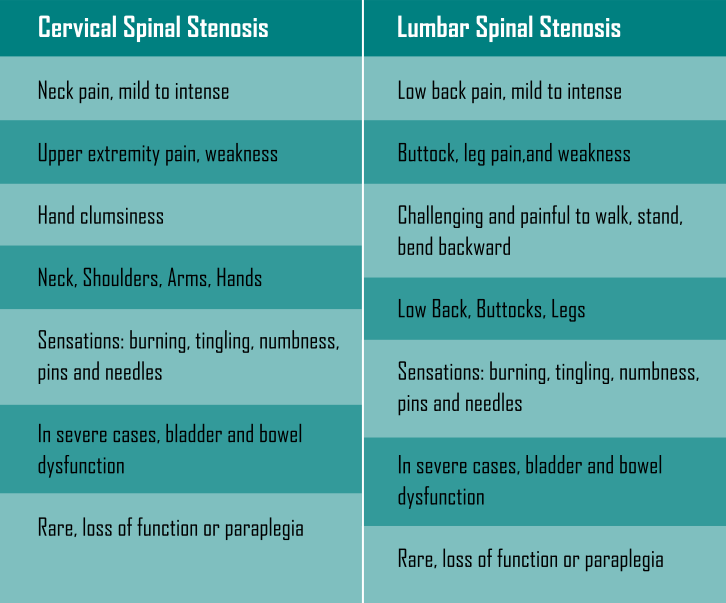 Spinal stenosis can affect both the upper and lower areas of the spine. The common reason for this condition is aging which results in a gradual degeneration of the spinal components. As that takes place, the spinal canal narrowing begins to compress the spinal cord. Because of limited spaces, minor changes in the bone and soft tissues (spine ligaments) can result in compression of the affected spinal cord and nerve roots. This narrowing can also be genetic (congenital) or acquired (trauma, arthritis, tumor, bone disease) or a combination of both. Spinal stenosis is usually due to OA (osteoarthritis), which can cause a pinching of the spinal cord or emerging nerve roots. Stenosis is commonly seen in 50 years age groups. Usually, the narrowing is caused by spinal osteoarthritis, and the discs between the vertebrae (back bones). It can also be caused by a thickening of the ligaments in the back, as well as bulging discs that function to separate the vertebrae. 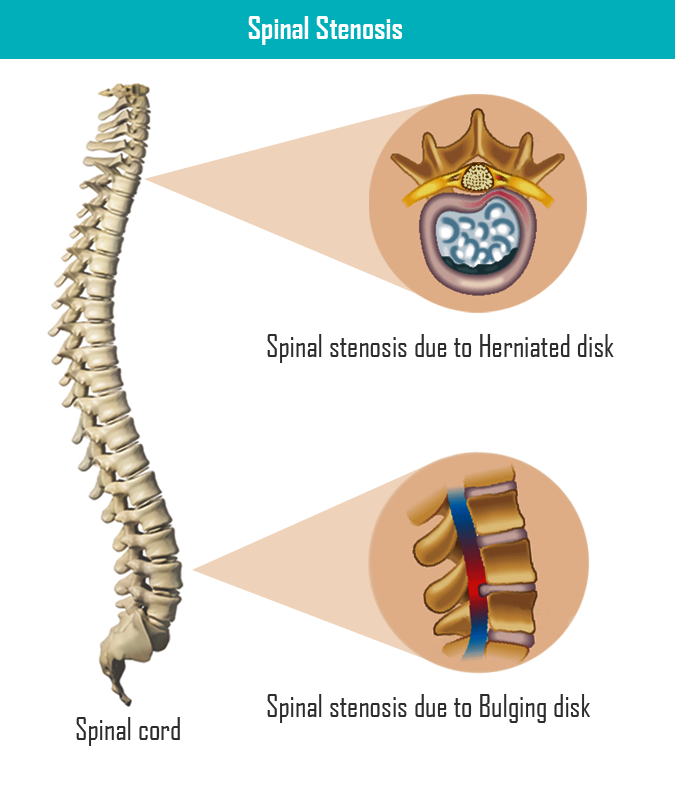 Symptoms of spinal stenosis present gradually but worsen over time. Pain may begin to radiate to other parts of the body including legs. The leg pain can become so severe that even walk short distances become difficult. Often, patients should sit or lean forward on a grocery cart, counter top or a walker to relieve pain temporarily. 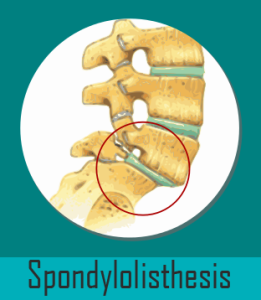 Spondylolisthesis or instability of the spine: When one vertebra slips forward on another, which can narrow the spinal canal. Trauma: Injuries and accidents may either dislocate the spine or causes spinal fractures which can narrow spinal canal. Spinal fractures that produce fragments of bone that penetrate the canal. Spinal stenosis causes back pain as well as pain in the lower limbs (legs). Stenosis may pinch the nerves roots that control muscle power and sensation in the legs. Consult an experienced spine specialist because an accurate diagnosis is essential to an efficient and successful treatment plan for spinal stenosis. Your complete medical history and physical and neurological examinations are critical. You and your doctor should talk about your symptoms, severity, and the treatments tried. The doctor tests your reflexes and evaluating muscle weakness, loss of sensation, and signs of neurological injury. Diagnostic tests may include X-ray, CT scan or MRI or myelography helps the spine surgeon to anaccurate diagnosis. Drug based treatment is usually tried first. The goal is to relieve your pain. Cortisone injections in the spine can reduce swelling. The non-steroidal anti-inflammatory medicines (NSAIDs) such as aspirin or ibuprofen may help to relievepain. Physiotherapy may also be an option. It can serve to the strengthening of muscles and stretching of your body. Laminectomy: It is the most common type of surgery. The region of the vertebrae is removed to provide more space for the nerves. Foraminotomy: Is done to widen the part of the vertebrae where the nerves exit. Spinal fusion: Is typically performed in the most severe cases. To treat affected bones of the spine bone grafts and metallic implants are used. The purpose of physical therapy is to relieve pain and allow you to return gradually to your daily activities. In spinal stenosis, physiotherapy involves treatment with physical or mechanical means, such as through exercise or heat. Physiotherapy may reduce pain in the soft tissues (such as the muscles, tendons,and ligaments), improve function, and build muscle strength. A physical therapist provides these treatments and also provides education, instruction, and support for recovery. Your doctor or a physical therapist designs a program specific to your normal level of activity, physical fitness, and severity of pain. Spinal stenosis (narrowing of spinal canal) is a common cause of low back pain and neck pain affecting some of our young adults and many of our elderly. The diagnosis is made by history and physical examination with radiographic confirmation. It can treat effectively in most cases non-operatively. In certain incidents, surgery may be an effective option. Treatment goals include pain management and improvement in function, mobility, and overall quality of life. Back Pain, Spine Surgery back pain causes, herniated, low back pain, lumbar, physiotherapy, second opinion, slipped disc, spinal stenosis, spine surgery, surgery. permalink.